The idea of a “Hindu Halloween” may sound offensive to some, just another attempt to inculturate the Hindu youth into Western culture. What would be the practical benefits of a “Hindu Halloween” anyway, why am I even suggesting this? I’m suggesting this because our Hindu children are celebrating Halloween already, whether we like it or not, but there is a twist, and that is Halloween is much less Christian and much more closely related to our own festival of Pitru Paksha than most Hindus know. What do the Hindu rituals of Pitru Paksha (fortnight of the ancestors) and the Western festival of Halloween have in common? More than some people might think, especially when we look at the pagan roots of the “ghostly” Halloween and how they relate to the Hindu “fortnight of the ancestors”, both which occur right around the same time. Pitru Paksha literally means “fortnight of the ancestors” and takes place during the 2nd paksha (forthnight) of the Hindu lunar month of Bhadrapada, which roughly correlates with late September to early October. 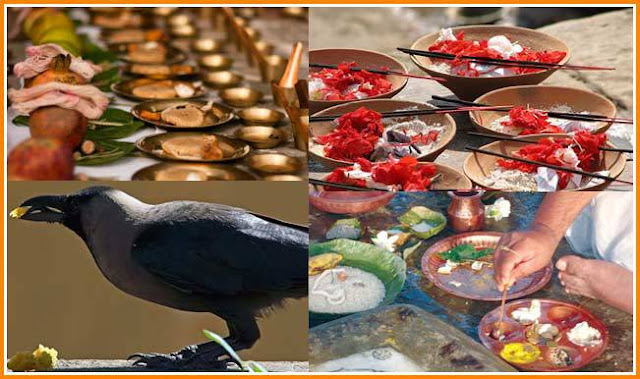 During this time Hindus perform many rites and rituals to commemorate and propitiate their ancestors (known as Pitrs). Special meals are prepared and laid out for relatives who have passed on and who are welcomed back into the home during this two week period to bestow their blessing upon their descendants and families. The meals that are prepared for the ancestors (Pitris) are often fed to crows and these meals traditionally contain a gourd or pumpkin… sound familiar? Because the festival involves communing with the spirits of the dead and because the festival takes place during the “dark fortnight” when the moon is waning, Pitru Paksha is viewed as being inauspicious by many Hindus and can sometimes take on an eerie connotation, just like Halloween. Now let’s take a look at the Western tradition of Halloween. Like Pitru Paksha, Halloween takes place during the fall (Oct 31st) and is associated with darkness, spookiness and the dead. The word “Halloween” is short for “All Hallow’s Eve” and is the night before the two-day Christian festivals of All Saint’s Day and All Souls Day. 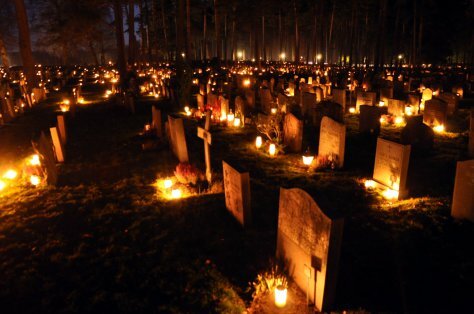 On All Saint’s Day many Christians commemorate the Saints of their church and on All Souls Day many Christians will commemorate the deaths of their own personal relatives or loved ones. Because Halloween is the evening before these two festivals of the dead, many believe that on Halloween night, the dead souls are rising up out of their graves in preparation for the celebrations, so that is why on Halloween many Westerners dress as ghosts and goblins. 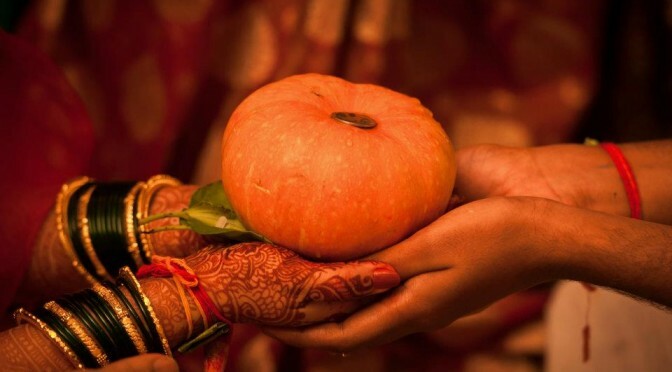 Because of its closeness to the fall harvest, Halloween is often associated with pumpkins, gourds and squash, crows and scarecrows, similar to Pitru Paksha. Even though Halloween is slightly associated with Christianity, it should be fairly obvious that the festival’s origins are pagan. There is no “All Saint’s Day” or “All Souls Day” in the bible and certainly no custom of dressing up as ghosts to celebrate the rising souls of the dead. Halloween was originally a Gaelic (Irish) festival called Samhain. 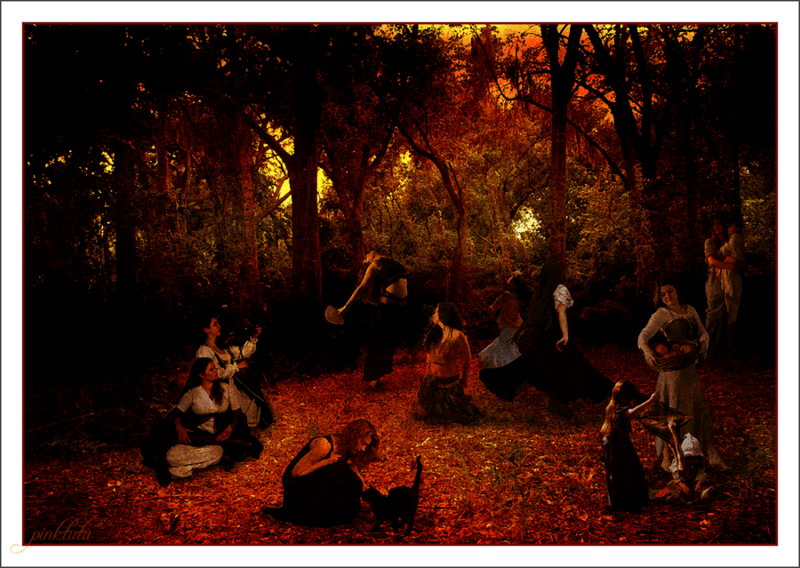 Samhain took place at the end of the fall harvest in ancient Ireland. During this time it was believed that ancestors would come to the homes of their descendants and would require that a meal to be put out for them, the same exact ritual as Hindu Pitru Paksha, and right around the same time of year! Because it was believed that not only ancestors, but also fairies and other spirits could enter the world at this time, Irish pagans used to dress up in costumes to represent these spirits and dance around bonfires, thus the custom of dressing as ghosts and ghouls on Halloween. As we can see there are many similarities between the Hindu “fortnight of the ancestors” or Pitru Paksha and the original Irish pagan Halloween celebration of Samhain. Both festival take place in the fall, both festivals involve laying out meals that memorialize our ancestors, and both festivals have a slightly inauspicious and ghostly or scary theme. However, some have suggested that the connection goes beyond just mere coincidence and points to a link between the two cultures. Linguists have theorized that Samhain is old Irish for sam (‘summer’) and fuin (‘end’) or “summer’s end”. However, others have not failed to notice that the old Irish word for summer (“sam”) is very similar to the Hindu Sanskrit term for season which is (sma). Even if this particular linguistic similarity is not a true connection between Samhain (also known as Halloween) and Pitru Paksha, we should always remember that the word “Indo-European” exists for a reason, meaning that it is agreed upon by all scholars of language and religion that there is a linguistic-religious connection between India and Europe, with Sanskrit and Hinduism being the oldest known language and religion in this continuum. Could it be that Irish pagan Samhain is somehow related to Hindu Pitru Paksha? 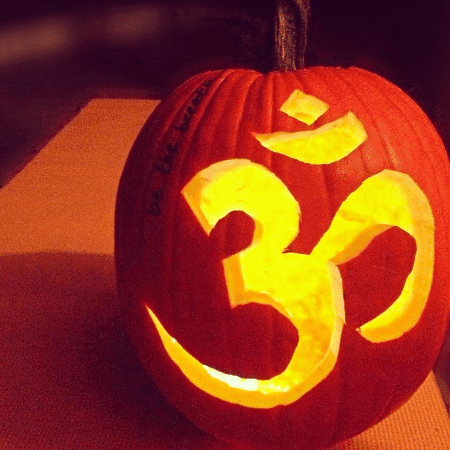 What would happen if Hindus started making om Jack-o’-lanterns and putting them out around Halloween? Could it be a conversation starter about our festival of Pitru Paksha? Could we blend Hindu and Western customs to make Hinduism more relevant to the new world? Wouldn’t it be better to use the power of Halloween to turn people’s attention back to ancient customs and their connections or even roots in Hinduism? What is being proposed here is not the erasure of Hinduism with Halloween but the Hinduization of Halloween, the reverse inculturation of our Hindu youth and the Western youth by using Halloween to remind both of them of an ancient Pagan past which is linked to a Hindu present. Time and experimentation will tell if and how Hinduism and Halloween can blend, but there is certainly room for Hindus to adapt to new (and old) customs while still maintaining our identity. This entry was posted in LATEST NEWS, LATEST NEWS - News, USA & CANADA, USA & CANADA - News, WORLD, WORLD NEWS. Bookmark the permalink.